Horsehair crab is a small crab that is well-known to be taken from the waters surrounding Hokkaido, Japan. It is a delicacy in Japanese cuisine that can't be said to be eaten all year round. It can be added to hot pots, miso soup, and a dish called kanisu, which involves eating crab with vinegar. The calories in Horsehair Crab per 120g(1 edible part) is 86 calories. 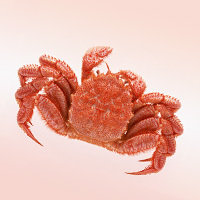 Horsehair Crab is calculated to be 72Cal per 100 grams making 80Cal equivalent to 111.11g with 18.96g of mostly protein、0.6g of fat、0.24g of carbohydrates in 120g while being rich in vitamins and minerals such as Vitamin B12 and Copper.